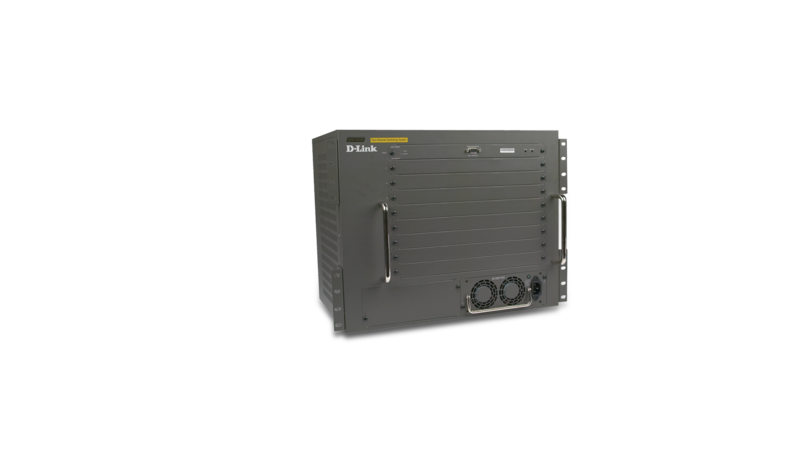 For a customized solution based on your business’ needs, D-Link’s DES-6500 modular chassis allows you to implement a solution-specific switch with multiple modules. The DES-6500 is a Layer 3 backbone chassis-based Gigabit switch that provides everything a business needs for a switched network. This 9-slot chassis offers a high switch fabric capacity of 160Gbps supporting wire speed L2/L3 packet switching in dynamic or static environments. Some of the features include a high port density, with L2/L3/L4 Class of Service (CoS) and Access Control Lists (ACL), Multiple link aggregation, fault tolerance, a hot-swappable CPU module/line card and redundant power supply, and traffic monitoring. Designed for performance and flexibility, this chassis offers you the price/performance ratio necessary to deploy a cost-effective enterprise backbone network. With 8 line card slots and a wide range of user-selectable port types and speeds, the switch provides easy scalable expansion as your network needs grow. This switch provides redundancy of power, link aggregation, STP, and VRRP, which prevents single point of failure, minimizes possible network downtime, and increases the network’s availability. Line card hot-swappable capability makes it easy to swap defective line cards, shorten the network restoration time, and simplify troubleshooting. Increase security by taking advantage of 802.1x, RADIUS authentication, TACACS+, SSL, and SSH network security features. The hardware and software features of the DES-6500 all work together to allow customers to build affordable, high performance, high availability, and highly secure networks. You can configure the switch with up to 96 Gigabit ports, 192 twisted-pair Fast Ethernet ports or a combination of both. Copper and fiber Gigabit are supported. Built-in wire-speed switch fabric provides hardware-based packet filtering and forwarding, while packet routing is performed by on-board ASICs, which are many times faster than traditional CPU-based routers. The DES-6500 supports a variety of network management options including: console CLI, Telnet configuration, Web-based and SNMP v1, v2, v3 management, RMON monitoring, TFTP firmware upgrade, TFTP configuration download/upload, Port Mirroring for troubleshooting, and BootP/DHCP IP assignment. It also supports advanced traffic management options including: 802.3x, Bandwidth Control, Broadcast Storm Control, Traffic Segmentation and IGMP snooping. Live CPU utilization monitoring and port descriptions are available to help troubleshoot when a performance degradation occurs. The DES-6500 supports IP (RIP, OSPF) and IGMP, DVMRP, and PIM multicasting for logical network segmentation and traffic control. It also supports a complete set of Spanning Tree Protocols (STP), Rapid Spanning Tree Protocol (RSTP), and Multiple Spanning Tree Protocol for Layer 2 redundancy. This product was phased out on: 9.11.2010. This product's last date of support is on: 8.11.2015.